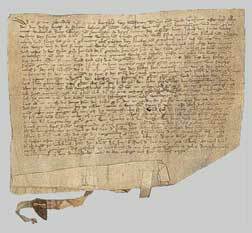 The picture above shows the contract between the feudal count Montfort and six vassals. Three of them are mentioned as the brothers Jakob, Wilhelm and John, sons of Werlen. The contract was written in the year 1313. At that time Count Montfort mastered the present-day Vorarlberg (Austria, near the Swiss Border). The vassals where so said Walser a special ethnic group, at the time colonizing the highest alpine valleys. The Walser originated from the Goms (a valley in the today Swiss canton Valais). In Valais Werlen were not documented before 1340. The contract of 1313 is the eldest record of the name Werlen, allowing the conclusion that Werlen lived in Valais already before 1280. But please be aware, that in 1313 surnames (as we know them in our days) where still unknown. So, we don't know exactly if the father of the 3 brothers was bearing Werlen as epithet or as firstname.
" jacobe, wilhalm un(de) johanse gebrud(e)rn .w(e)rl(en) sune . ". Thanks to Cornelia Albertani, from the Voralrberger Landesarchiv and to Barbara Fritz, from the Vorarlberger Walservereinigung. They provided the pictures and supported my research.